The COSAM Dean's Leadership Council is a network of alumni and friends who believe in enhancing and promoting the sciences and mathematics mission of the college. The lives of these exemplary volunteers epitomize the characteristics found in well-rounded citizens of the world. Through the Dean's Leadership Council, members carry forth the banner of Auburn University by providing visibility and service to the educational mission of COSAM. Graduates and interested parties of COSAM’s five departments are eligible to serve on the Dean's Leadership Council. They are proven intellectuals, visionaries, philanthropists and persons highly experienced in both university, government and in the industrial sectors. The membership collectively represents those with a sound educational background and an appreciation for the complex fields of the sciences and mathematics. One such individual is Harold Zallen, distinguished visiting research professor in Auburn University’s College of Engineering, who has been a member of the COSAM Dean’s Leadership Council since 1999. He holds a bachelor of science in pharmacy from Northeastern University; a master of education with a triple major in science education, mathematics and statistics, and psychology from Boston University; a master of science in organic pharmaceutical chemistry - biochemistry from Purdue University; and a doctorate in physical analytical pharmaceutical chemistry - bio-nucleonics, also from Purdue University. His life’s work has brought him a myriad of experiences and job titles including: civilian and military aviator; registered pharmacist; professor; department head, dean, vice president; research director; consultant; author; Army officer; and Department of Defense advisor. Despite his many titles, Zallen identifies himself as a chemist. In 1961, he was professor and head of what was then Auburn’s Department of Radiological Sciences; a department he designed and conceived, uniquely with only graduate students, and received adequate funding from the U.S. government. At that time the Department of Radiological Sciences was under the College of Science and Literature, which later split to become COSAM. Because of this split, Zallen has a strong affinity toward COSAM and it shows through his actions. 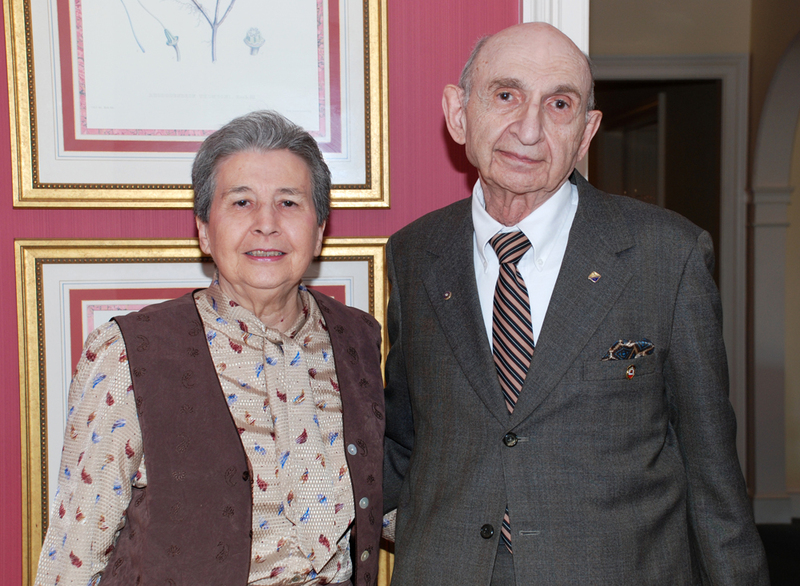 Besides serving on the Dean’s Leadership Council, he and his wife, Dr. Eugenia Malone ‘53, established several Malone-Zallen Graduate Research Fellowships, and one such is in Chemistry and Biochemistry. The fellowship has provided graduate students in COSAM’s Department of Chemistry and Biochemistry with monetary support and the opportunity to utilize their scientific knowledge by applying their wisdom toward real-world problem solving. Zallen is not only a financial supporter of research; at 86 years of age, he is still spearheading major research projects. In fact, Zallen’s most recent research manuscript was published in the prestigious Aircraft Engineering and Aerospace Technology: An International Journal Volume 84: Issue:1, 2012. The article is titled, Head-tilt and pilot fatigue measured by flight simulation, and was written by Zallen, John E. Cochran, Jr. and Judith A. Bailey. Cochran is professor and head of Auburn’s Department of Aerospace Engineering. Bailey contributed to the manuscript as an undergraduate research associate and is currently an Aerospace Engineering master’s graduate student in the College of Engineering at Auburn with her thesis being directed by Zallen and Cochran. She is studying both head tilt and pilot fatigue in unmanned aerial systems. 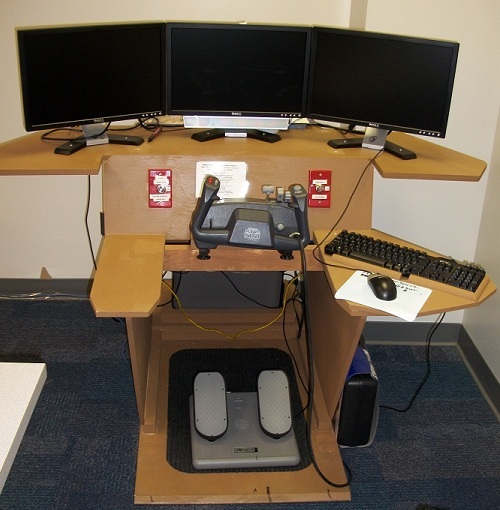 Zallen designed and modified the construction of a flight simulator that was built jointly with James J. Baird [deceased] in Baird’s home workshop. Baird was also a pilot and understood how the flight simulator would be used. A long-time member of the COSAM Dean’s Leadership Council, Baird was an active participant in the research endeavor. The underlying justification for the research is to reduce the number of airplane crashes that are a result of pilot error in both piloted and non-piloted aircraft. Zallen used a mathematical algorithm which allowed measurement of head motion in the cockpit derived from a derivative of missile-tracking technology he learned at the Army War College. Instead of using statistics, the results were time-sliced, much like the method used in a CAT Scan or MRI procedure used in diagnostic medicine. Zallen has long been a champion of multi-disciplinary research, a definitive key to the success of this most recent research project. The manuscript shows a myriad of individuals who contributed including pilots; aviation experts; aerospace engineers; audiology-vestibular expertise; active faculty; administrators; and retired U.S. Air Force and U.S. Army combat pilots. “With a project like this, you must stay focused on the positives because there are multiple negatives which can be distracting and depressing enough to scuttle the project. It would take approximately four to six months for the reader of the manuscript to duplicate the work, assuming they were expert in software engineering. The organization actually began December 2007 and was completed in May 2011 with manifold negatives,” Zallen said. This latest research is not the end of a long and storied career as he continues work focused on unmanned aircraft systems. A registered pharmacist in Massachusetts since 1951, Zallen joined the faculty at Mercer University’s College of Pharmacy in Atlanta, Ga., in 1960. After spending a summer at the CDC in Atlanta, he was hired by then Southern Regional Education Board executive director Dr. Robert C. Anderson, who had already been chosen to be Auburn University’s next executive vice president and associate professor and associate director of the future Leach Nuclear Science Center in 1961. Zallen later foresaw the probability of a critical nuclear reactor not being fulfilled, thus he conceived, designed and received adequate funding for the Department of Radiological Sciences. According to Zallen, 84 people and every conceivable committee possible studied and re-studied the proposed department. Finally the Board of Trustees approved the new department. The following day, after the Trustees approval, the U.S. government funded Zallen’s proposal for over one-third of a million dollars. He was promoted to a tenured professor and head of the Department of Radiological Sciences. The Radiological Sciences Department was the only department engaged exclusively in graduate study and with dual majors. In 1966, Zallen went to Washington D.C., where he first served as the head of the Division of Curriculum DHEW and liaison to the National Academy of Science, National Academy of Engineering and the National Science Foundation, or NSF. He joined NSF as director for the Instructional Scientific Program, Special Projects Program, and Government Instruments Surplus Program. He returned to academia in 1972 as a tenured professor of analytical chemistry and associate dean of Graduate Studies and Research at Oklahoma State University. In 1973, he was named research professor of molecular biology & biochemistry as associate vice president and chief executive officer of the University of Oklahoma City Health Sciences Center, or OUHSC, campus and the OUHSC Tulsa Campus. He began his consulting career two years later when asked by the chancellor of the Oklahoma System of Higher Education, Dr. E.T Dunlap, to evaluate the new Oklahoma College of Osteopathic Medicine and Surgery, or OKOMS. He did so and reported his findings. He was then named the only vice president at that institution. He has consulted for entities in government, universities, research laboratories and in the industrial sector. His consulting led Zallen to start his own company, Malone, Zallen & Associates, which later became Malone Group International, or MGI. MGI served as a member of the Southern States Energy Board, which included 17 States and Puerto Rico; U.S. Atomic Energy Commission; Vice President for Nuclear Affairs by Optimal Systems Inc.; universities in California, Texas, Oklahoma, West Virginia and New York; and industrial organizations in Bourges, France, Ingelheim, Germany, Cairo, Egypt, Tokyo and Japan. He still serves as president and CEO. His military service is extensive and includes pre-active duty (not yet 18 years of age but sworn in as a Pre-Aviation Cadet, USAAF). At 17, service in the Civil Air Patrol flying from Cape Cod, Mass., as navigator, radioman, observer and co-pilot of an Aeronca Chief looking for German Navy submarines going to the three-mile limit and often out to six to eight miles when a tail-wind allowed. At 18 in WWII in the USAAF, he flew as an enlisted bombardier (the USAAF reduced Bombardiers Grades from 2nd Lt.’s., and Flight Officers to Sergeants). He flew as combat crew in a Boeing B-17G Flying Fortress for the 8th Air Force 487th Bomb Group, “Twelve O’clock High” in the European Theater from 1944 to 1946. In 1956, he was commissioned as a 1st Lt. in the Medical Service Corps. He took advantage of the various U.S. Amy Schools and attended the Command & General Staff College and completed the Army War College (ICAF) as a Major. He later became a nuclear effects officer, serving on the General Staff. He retired as a Colonel 0-6(P) in 1986. An O-6(P) is promotable to Brigadier General. Since his military retirement, he has served as a classified security advisor to the U.S. Department of Defense. He was a finalist in two important positions: a White House appointment to the Hazardous Waste Commission and Deputy Secretary of Energy (Nuclear Affairs). Zallen has numerous honors and awards including: Outstanding Alumni Award, 1996, Northeastern University; Certificate of Merit and Key to the City, 1973, Mayor of New Orleans; Commanding General U.S. Infantry Center Award of Excellence, Fort Benning, Ga. 1998; Service Above Self Award, Rotary International, 1986; consultant to the Southern Interstate Nuclear Board (17 States and Puerto Rico), 1973-1975; and Primary Alternate to North Carolina Governor James G. Martin, Ph.D. chemistry, on the Southern States Energy Board, 1986-1989. He is a member of several honor societies such as: Phi Lambda Upsilon (Chemistry-Chemical Engineering); Society of Sigma Xi (Science-Research); Beta Phi (Pharmacy); Rho Chi (Pharmacy); American Chemical Society (Research Professor, 2007); and Phi Delta Kappa (Education). His Honor Listings include Marquis Who’s Who in the World; Marquis Who’s Who in America; American Men of Science; and Who’s Who in Computers. He has also served on four hospital boards, and two university boards, and is well published in both research papers and books. One of his Books, Ideas Plus Dollars: Research Methodology and Funding, written with his wife, Eugenia M. Zallen ’53, was first published in 1975, saw a second edition in 1979, and the third edition is currently in preparation and will come out in 2013. This treatise has enjoyed readership and adoption in various universities, and records indicate that sales were made in 54 countries. Zallen currently lives in Auburn with Eugenia, his wife of 52 years, who is a retired professor and academic dean. To learn more about the COSAM Dean's Leadership Council, contact Brook Moates at brook@auburn.edu or (334) 844-2931.